Explore the culture of Swaziland and the pristine beaches of Mozambique on this adventurous overland tour, travelling in a rugged overland truck by day and sleeping in simple en-suite accommodation. Also visit the Kruger National Park, home of the Big Five, and Hlane Royal National Park. Activity pack included. Monthly departures, with group size 4 to 18. You will be met at Johannesburg Airport and transferred to your overland base in this thriving city. Check in and relax under warm blue South African skies. This morning you will be collected from your Johannesburg hotel and taken to the departure point for your group adventure tour, travelling in a rugged 4x4 overland truck. We travel 5-hours through the farmlands and mountains of beautiful Mpumalanga to the Lowveld and the world famous Kruger National Park. Our truck gives us a height advantage over other vehicles, which means better photographs and game viewing opportunities in this vast 2-million hectare game sanctuary that is the size of Wales. Hopefully we will see antelope, zebra, wildebeest or maybe even giraffe before we reach our accommodation. On arrival you can enjoy an optional sundowner drive (pay locally), then relax in the atmosphere that only the African bushveld can provide. Note: Regardless of lodge meal plans, all your meals are included whilst on tour and will be prepared & served from the overland vehicle - except for specified optional dinners in cities. Alcohol is not included. Accommodation varies and includes lodges, hotels, hostels, chalets, permanent tented camps and traditional huts. Bedding is provided, but you do need to bring your own towel. Truck lockers are 30 x 80cm, so please use soft bags that will fit (but there is no weight restriction). Please be aware that accommodation sometimes has to be substituted for operational reasons. We start today with an early morning Walking Safari in the Kruger National Park with an armed park ranger, to experience the excitement of viewing the birds, flora and fauna of the park on foot. Afterwards we leave the park and journey along the beautiful Drakensberg Panorama Route. This is one of South Africa’s most scenic drives and includes Bourke’s Luck Potholes, Gods Window, the three Rondavels and the green Blyde River Canyon - the third largest in the world. We return to camp in the evening and enjoy a lovely local dinner and dancing. This morning there is the option of an early Bush Walk (pay locally). Afterwards we set out to explore the beautiful Panorama Route. This is one of South Africa’s most scenic drives and includes Bourke’s Luck Potholes, Gods Window, the three Rondavels and the green Blyde River Canyon - the third largest in the world. After enjoying this beautiful drive, we return to camp in the late afternoon. We re-enter the Kruger National Park this morning for more game viewing from our overland truck, travelling southwards through the park. We exit the park in the afternoon and travel for 5-hours, crossing the border into the mountainous kingdom of Swaziland, a landlocked country bordered by South Africa and Mozambique. We arrive at Mlilwane Wildlife Sanctuary. As there are no large predators in this reserve, you can relax and enjoy walking amongst the wildlife of Swaziland's oldest game sanctuary covering over 4,500 hectares, which is an excellent way to enjoy the flora, fauna and bird life. This morning there is the opportunity to participate in an optional visit to the Rhino Sanctuary in Hlane Royal National Park (pay locally). In the afternoon you will be introduced to the rich culture of the Swazi people, as we are invited by the Chief to visit Umphakatsi Village and learn more about the traditions of this proud nation. Today we drive 4.5-hours drive from Swaziland to Mozambique, crossing the border and driving to the capital city of Maputo, which offers offers a vibrant and eclectic mix of cultures. After checking in to our hotel, enjoy the warm subtropical climate of this coastal city. In the afternoon enjoy a guided walking tour to explore the city sites. Maputo offers interesting and varied architecture and no visit would be complete without a visit to a market. Tonight there is the option to eat out and experience the night-life of this intriguing city (pay locally). A full day on the road today as we follow the Indian Ocean coastal road and drive 7.5-hours northwards through the Xai-Xai district to Inhambane. There is much to see as we pass many villages and plantations of coconuts, cashews and sugar cane. Our journey will bring us to pristine palm lined beaches for relaxation and ocean fun. Tonight we are welcomed with an included traditional Mozambican dinner. At leisure to sunbathe on golden Barra Beach and swim in the warm blue waters of the Indian Ocean. Snorkelling is available off the nearby Mozambique Reef and scuba divers can explore this pristine reef off Tofu Beach, famous for encounters with gigantic whale shark and mantas. Fishermen can try their hand at exhilarating deep sea game fishing, in waters considered to be the best for marlin in the world. Other optional activities include an Ocean Safari to search for marine life and Quad Biking (pay for all activities locally). Today we make the short drive to Tofo Beach to spend the day enjoying yet another of Mozambique’s iconic beach destination. With safe swimming, a charming market and a number of popular beach bars, Tofo is perfect for a day’s outing. A second day not only ensures that you have the opportunity to make the most of the activities on offer, it also allows us some flexibility to adapt to the weather. This morning we make a stop in Inhambane where you will have the opportunity to explore the market and the historic streets of this former slave trading port. For those who enjoy an adventure, your guide will arrange one of the famous Dhow ferries to sail you across the bay. These sturdy old boats have plied the East Coast of Africa for centuries and the trip across the bay is a truly local cultural experience. If you do not wish to take the ferry, you can remain with the overland truck, which will meet the ferry at Maxine on the far side of the bay. Afterwards we continue to follow the Indian Ocean coastline northwards for 4.5-hours to Vilanculos - the gateway to the spectacular Bazaruto Archipelago with its vast unspoilt Indian Ocean beaches fringed by palm trees. 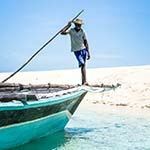 Today enjoy a full day excursion by traditional Arab Dhow to the islands of the Bazaruto Archipelago, one of the largest Marine reserves in Southern Africa. We spend the day exploring the islands, snorkelling and enjoying the beaches of this paradise. Be sure to keep your sunblock handy as today is filled with sun, sea, sand and exploration. We return in the afternoon and enjoy a well-earned night of rest. Well rested, another full day on the road today as we set course for the Xai Xai district, arriving in the late afternoon. Early risers can enjoy the sunrise on the beach this morning, before we depart today. We pass through the capital city of Maputo and continue to the border, re-entering South Africa for our final night near the town Malelane. Our final road trip takes us back to Johannesburg as we reflect on the wildlife and beaches that have filled our days. All travellers are invited to join us for a traditional Braai tonight, this can be booked with your guide on the day before arrival. Many great tales are shared around the braai fires and tonight presents an opportunity to join fellow travellers in celebrating the many wonders of African travel. Our tour ends in Johannesburg, with optional farewell barbeque together (pay locally). Note: You will arrive back in Johannesburg too late to fly home the same day. Transfer to Johannesburg Airport for your flight home.